Sorry to make your trip to Europe harder by adding another fantastically beautiful spot for you to explore. 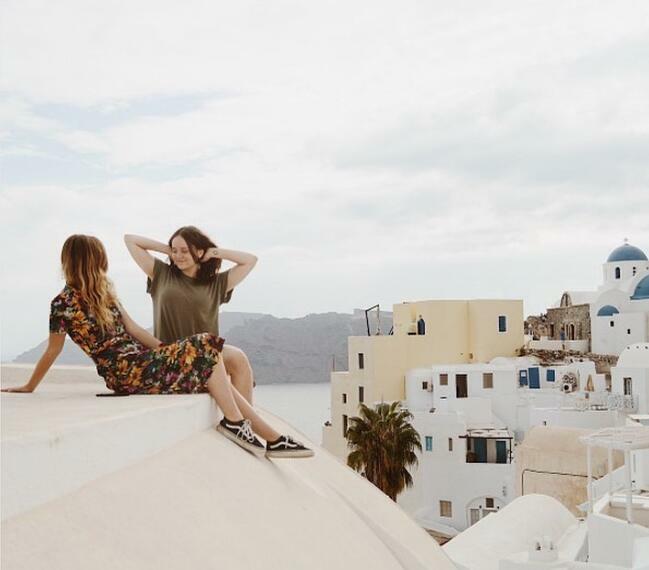 Between the ancient cities you can find in places like Athens, and the picture-perfect old sunset views in Santorini and now the views found in Milos, we think you’ll probably end up spending quite a bit of your time in Greece when you’re in Europe. This European Destination Guide has our favorite cities and countries. 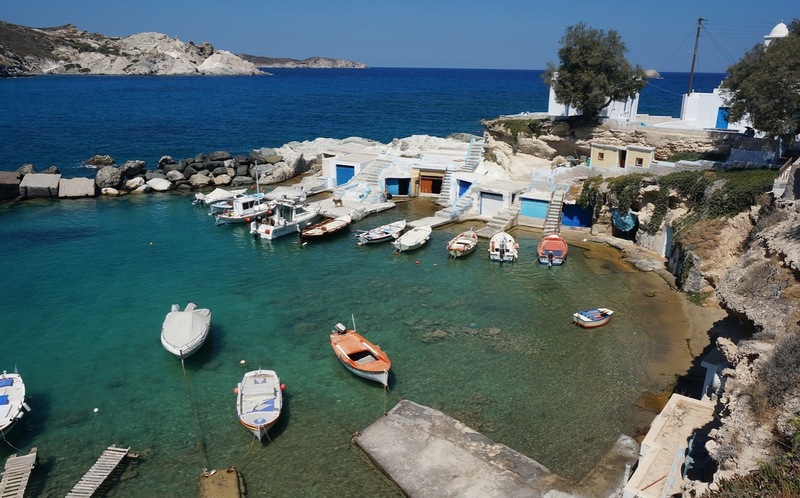 Milos has a volcanic history, you’ll see snow-white arches perched atop the turquoise waters of the Aegean sea … it’s beyond beautiful, and to make your vacation there even easier, we’ve pulled together a few helpful recommendations. As an island, Milos is surrounded by the ocean, but not all the best places to swim are found on the coast. The island has a dramatic volcanic past which has created inlets full of that dreamy turquoise-blue water you came here for. 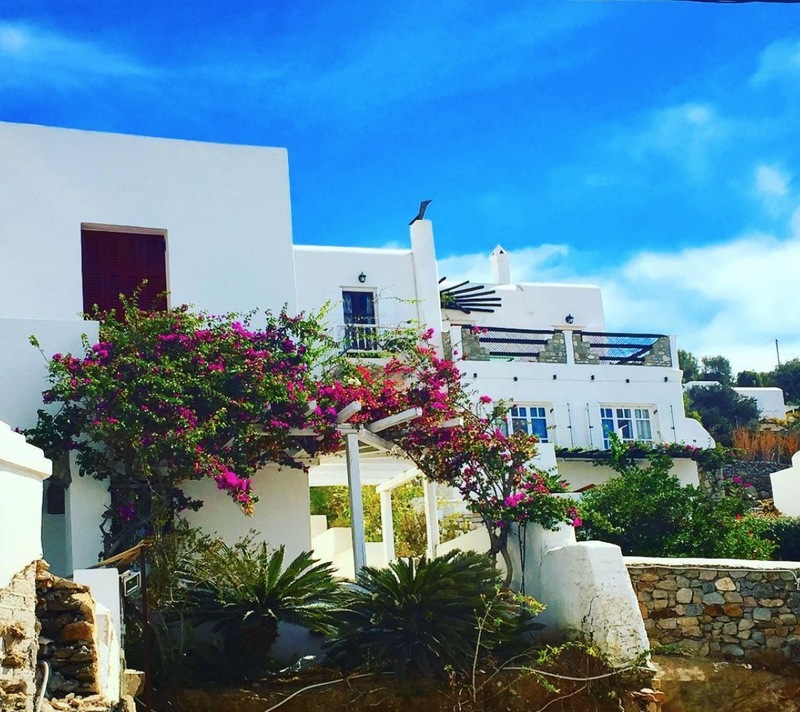 This blogger has outlined a few of the best places to swim in Milos, but we think you can’t leave without visiting Sarakiniko. 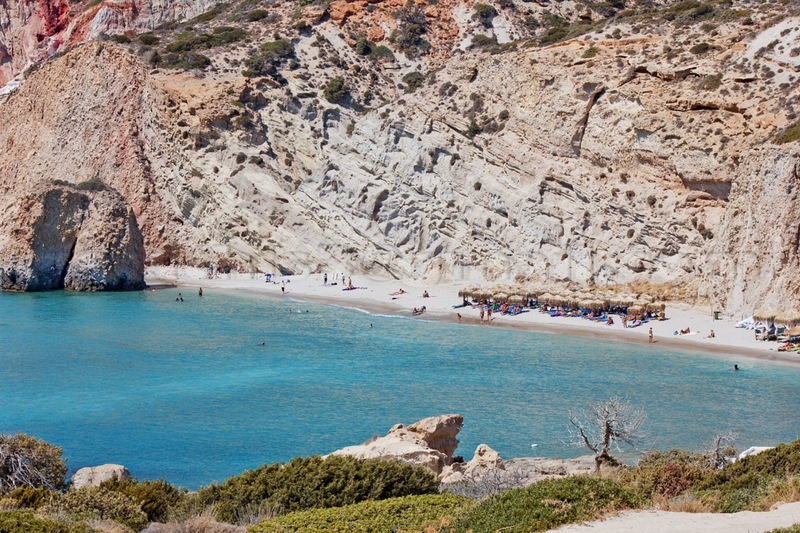 It’s one of the most famously pretty beaches in Milos, maybe all of Greece, thanks to the bone-white rocks that form unique swimming spots and cliffs. It’s definitely not the best swimming beach (though you can swim here) but it’s probably the prettiest. If you want to visit, go early (as in get there before 9:00 AM in the high season). You’ll be able to get there via taxi, and make sure you bring plenty of water. There isn’t any shade on these porcelain rocks! While you can visit some beaches by taxi (or bus), a few are only accessible by boat. 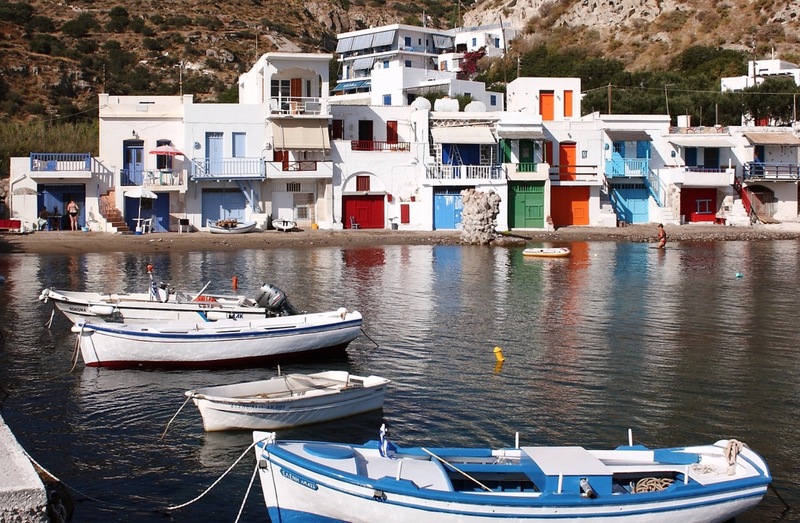 You can head to the two ports on Milos and book a boat tour to take you out for a day of beach hopping. We have ferry information and port information at the end of this post. Found right above the town of Tripiti, Klima is probably the most well-known fishing village in Milos. It’s a quiet, sleepy town with white-washed buildings fitted with colorful doors and balconies. Since it’s near the catacombs (we talk more about this below), it’s worth checking out if you’re already out in that part of the island. According to one ILP volunteer, the place comes highly recommended especially since it’s such a great place to take pictures. Easily reach the fishing town of Kilma by taxi. Not convinced a fishing tour will be the highlight of Milos? 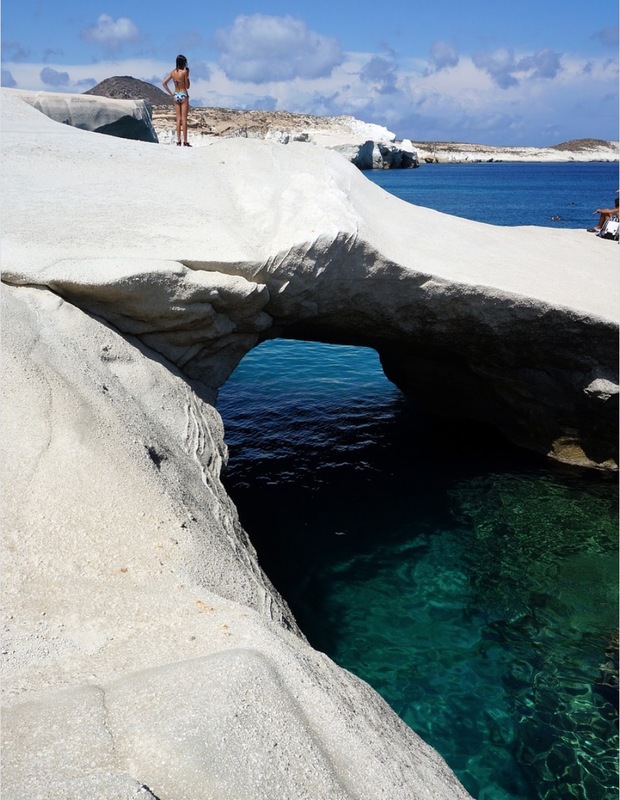 “It was the best part of our trip” according to some ILP volunteers vacationing in Milos. It was about 70 Euros and included food for the day, a boat tour of the island, and the whole experience of Milos’ history: Fishing. The tour includes the process of pulling in the fish of the day, cleaning the fish, and eating what you catch! One volunteer said “the fish was soooo good even though I’m super picky with fish, I loved it”. Their guides, Nikos and his wife, spoke rather good English which gave this group of volunteers the chance to sit and chat with people who grew up here, as well as the chance to spend a sunny day out on the ocean. In the summer time, the tour can also include a trip to an island for some beach time, but in the off season you’ll still get to experience the sea and may even get to see some starfish. Visit their website here and their Facebook page here. You probably came to Milos for the beaches and the views, but some of the side-adventures you can also experience here are some of the best. One ILP Group headed to the cemetery in Triovasalos which is one of the towns in Milos. It’s incredibly old and unique — partly due to the catacombs you can find there. The catacombs have been around since the 1st Century and are considered one of the three most important discoveries in the world of catacombs: just behind Rome and the Holy Land. Your inexpensive ticket (a few euros) includes a tour guide who will walk you through the small network of caves: it’s a short activity, maybe about 10 minutes to see it all, but makes for a fun little side adventure in Milos. You can read more about the catacombs here, but do know that it does come recommended by a handful of past volunteers. Sounds like where you’re going to want to eat for the whole time you are in Milos! Souvlaki is a traditional Greek dish, made up of grilled chicken and veggies, marinated in a spiced yogurt. It’s delicious, and one to try at O Belivanis. Also, don’t miss out on baklava at the bakery next door, it’s delicious. Here’s the link to her AirBnB — side note, you'll find gorgeously beautiful apartments all over the neighborhood (like this one below), so plan on spending an hour or two just wandering around your AirBnB's neighborhood to soak in the sites. All of Milos (and Greece for that matter) is rather photogenic. We suggest getting yourself to Athens first. It’s an incredible city to explore (get our go to guide for Athens here), plus it’s the ideal jumping off point for Milos if you’re going by ferry. You can get ferries and high speed catamarans from the Piraeus Port in Athens. Ticket prices depend on if you’re going in the high season or the low season, and how fast your boat or ferry will get you there. Prices tend to range from about 35 euros to 80 euros each way depending on what kind of boat you are taking. A ferry is about a 7 hour ride, while a high speed boat is around 4 hours or less). Book your ferry here. 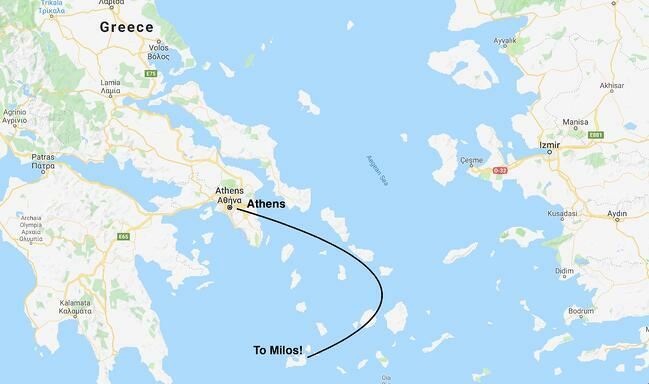 You’ll get dropped off at one of two ports in Milos: Adamas (the main port) or Apollonia. From there, a taxi can take you to where you are staying. Taxis are going to be the way to go. Since the island is small, you’ll probably run into taxi fares that are around 5 euros or less, unless you’re traveling a far distance. In the high season, you can also find frequent bus routes to the popular places you will want to visit from Adamas to Triovassalos, Plaka, Tripiti, Pollonia, Philakopi, Zefiria, Paliochori, Hivadolimni and Provatas. Hotels and some AirBnBs may be able to give you more info on buses, but you can also check the schedule and prices on the Milos Bus website. It’s really up to you, but the island is rather small with a few fabulous beaches, and a few side adventures, like the fishing tour and a few villages to scope out. You’ll probably be happy with about two days in Milos (maybe three or four if you’d like a slower paced trip). Want to see more of Europe than just Greece? You can't spend too much time in Europe ... and we're big fans of spending enough time in one place to really dive in and experience the culture, get to know the locals, and see the hidden local spots. That's what our volunteers get when they spend a semester volunteering in Europe with us! Learn more about how our program works for college-age volunteers by clicking that green button.